I’ve always wanted to try forcing some Paperwhite bulbs. 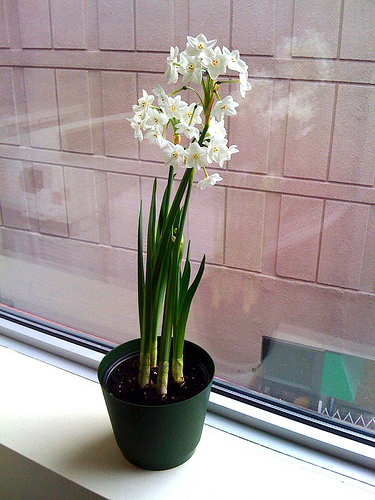 I usually give my grandmother an Amaryllis for Christmas but this year I got her some Paperwhites, to be a little different. Then I went out and got myself some because I was really craving some bloomage during these dark days. Now, for about a week and a half Chris and I have been detecting an ominous odour in the vacinity of Luna’s crate. Both of us were trying to figure out where on Earth the little devil had peed that we hadn’t found because our kitchen was progressively smelling more and more like a nursing home. We washed the floors several times, we washed her bed several times, we washed the tray inside her crate, pulled the crate away from the cabinets to see if anything had gotten underneath, cleaned there, and all to no avail. Last night I did it all again, and still there was this pee stench that hadn’t gone away one bit. I employed my superpowered sniffer (I have a ridiculously sensitive nose, so much so that it’s often a curse) and set about really sniffing around the front of the kitchen, Luna’s “zone” as I like to call it, where we have an extended child safety gate set up so that we can keep her contained when we can’t watch her, without having to lock her up completely in her crate. Luna is only really allowed in two areas of the house so the only places that she could be peeing where her “zone” and the living room, but she is never in the living room without us. 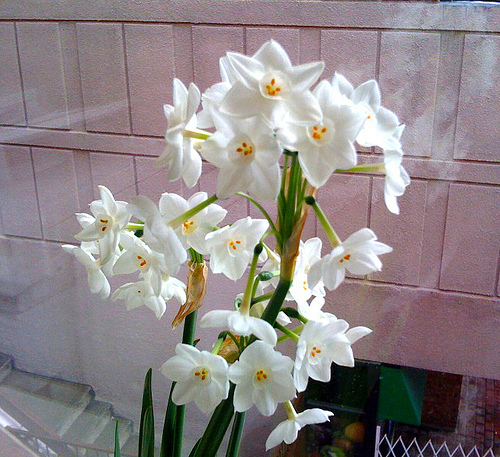 I noted the scent was coming most strongly from the front of the kitchen, near the window…near my plants…near my…Paperwhite flowers?! I couldn’t believe it! Here are these gorgeous little white blooms which, when sniffed up close have a not unpleasant flowery fragrance, but from a distance their scent is musky and hangs in the air like ammonia. Paperwhites are in the Narcissus family, the same genus as daffodils, which are of course known for their distinctly pleasant scent. Chris immediately said they had to go when I told him I’d finally figured it out. But how could I throw these lovely flowers in the compost before they’re even finished blooming? I opted to take them to the office. They survived the trip outdoors in the cold to work on the bus and I figured that surely the smell couldn’t be so bad that they wouldn’t be useful at least in brightening up the office. But it didn’t take long before they were ousted from the office as well. Now they live in the hallway with the photocopier. Needless to say I don’t think I’ll be growing these guys again. Oh and Luna, we’re sorry we blamed you! N.B. : The next day our VP came into the office asking if a drunk had been sleeping/peeing in the hallway where the photocopier is. NEVER AGAIN PAPERWHITES!! !